Allow users to write scripts to control your OS X app – giving it unprecedented usability. Discover how in this “Making a Mac App Scriptable Tutorial”. Update 9/21/16: This tutorial has been updated for Xcode 8 and Swift 3. As an app developer, it’s near impossible to think of all the ways people will want to use your app. Wouldn’t it be cool to let your users create scripts to customize your app to their own personal needs? The app shows a list of tasks with due dates in the next few days and the tags associated with each task. It uses an outline view to group the tasks by due date. Note: Want to know more about outline views? Check out the NSOutlineView on OS X Tutorial on this site. You might have noticed that you can’t add, edit, or delete any tasks. That’s by design – these actions will be handled by your user automation scripts. 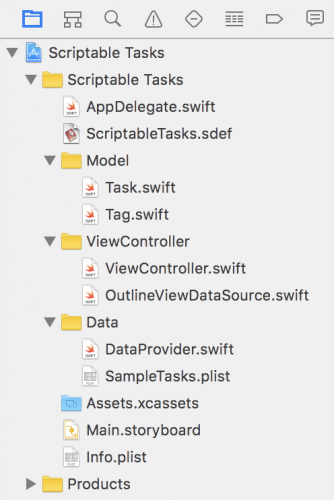 There are 2 model class files: Task.swift and Tag.swift. These are the classes that you will be scripting. The ViewController group handles the display and watches for changes in the data. 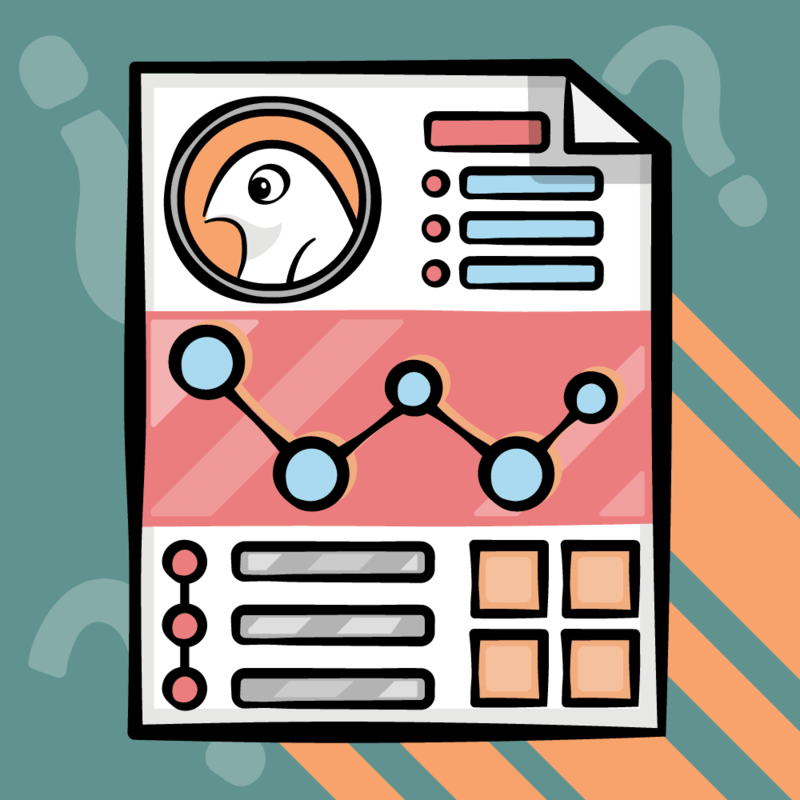 The Data group has a file with the sample tasks and a DataProvider that reads those tasks and handles any edits that arrive. The AppDelegate uses a DataProvider object to keep a record of the app’s tasks. The ScriptableTasks.sdef file is a crucial file…which you will explore in detail later. You’ll see a set of four buttons in the top toolbar: Record, Stop, Run, and Compile. Compile checks that your scripting is syntactically correct, and Run does pretty much what what you’d expect. At the bottom of the window, you’ll see three icons which switch between views. Description lets you add some information about your script, while Result shows the final result of running a script. The most useful option is the third button: Log. The Log offers a further four options: Result, Messages, Events and Replies. Replies is the most informative, as it shows a log of every command and the return value of that command. When testing any scripts, I highly recommend the Log in Replies mode. Note: If you ever open an AppleScript file and find it contains code like this: «class TaSk» whose «class TrFa» is false and «class CrDa», click Compile and it will be translated to readable AppleScript, provided you have the target app installed. There are two scripting languages you’ll cover in this tutorial. The first is AppleScript, introduced with Mac System 7 in 1991, which uses an English-like syntax to make it usable by coders and non-coders alike. Every scriptable app has a dictionary, stored in a scripting definition (SDEF) file. The dictionary tells you what objects the app has, what properties the objects have and what commands the app responds to. In the above screen shot, you can see that TextEdit has paragraphs, and paragraphs have color and font properties. You will use this information to style some text. You now have a new document, but it needs a bit of styling. Open 2. TextEdit Read Edit.scpt, run this script and you’ll see the document re-opened and styled as per the script. 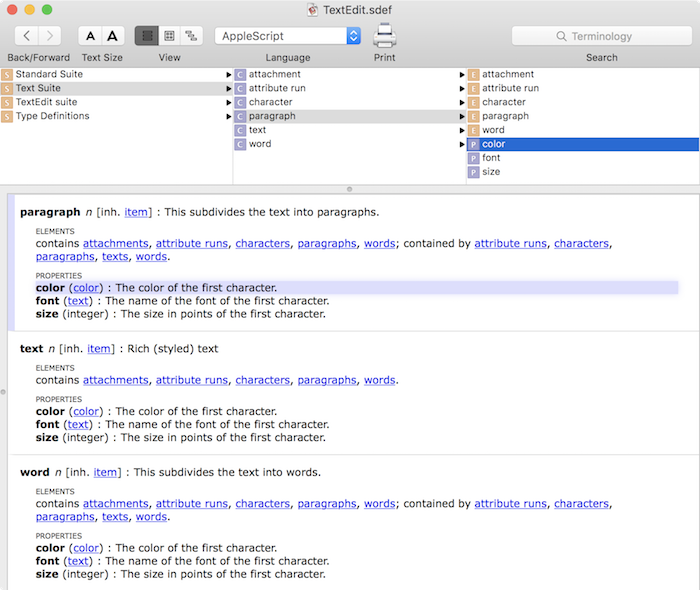 Although delving into the actual script is beyond the scope of this tutorial, feel free to read the scripts in detail to see how they act on the TextEdit document. The app restarts, but doesn’t come to the foreground. To bring the app into focus, change launch to activate in the script above and click Run. Now that you’ve seen that apps can respond to scripting commands, it’s time to add this ability to your app. Standard scripting objects and commands, such as window, make, delete, count, open and quit. Your own scriptable objects, properties and custom commands. In order to make classes in your app scriptable, there are a few changes you’ll need to make to the app. First, the scripting interface uses Key-Value-Coding to get and set the properties of objects. In Objective-C, all objects conformed to the KVC protocol automatically, but Swift objects don’t do so unless you make them subclasses of NSObject. 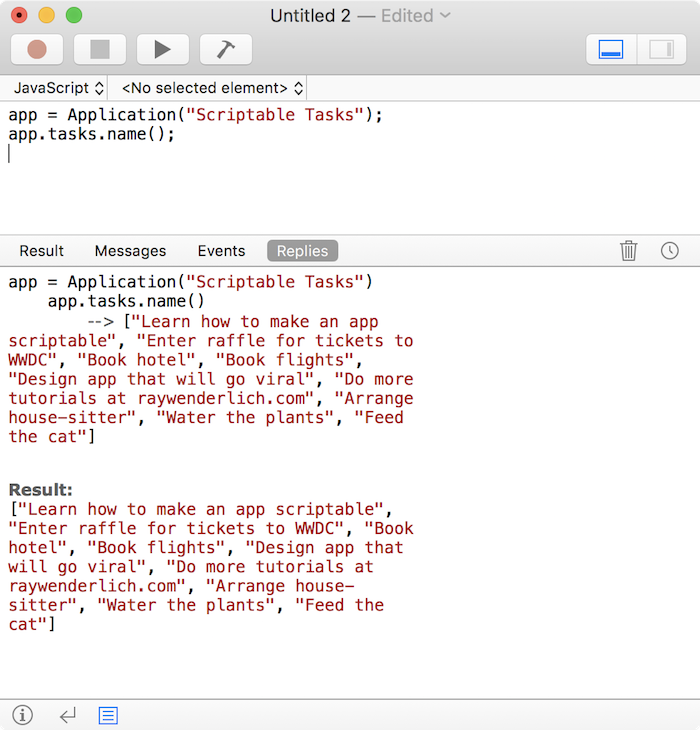 Next, scriptable classes need an Objective-C name that the scripting interface can recognize. To avoid namespace conflicts, Swift object names are mangled to give a unique representation. By prefixing the class definitions with @objc(YourClassName), you give them a name that can be used by the scripting engine. Scriptable classes need object specifiers to help locate a particular object within the application or parent object, and finally, the app delegate must have access to the data store so it can return the application’s data to the scripts. You don’t necessarily have to start your own scripting definition file from scratch, as Apple provides a standard SDEF file that you can use. Look in the /System/Library/ScriptingDefinitions/ directory for CocoaStandard.sdef. Open this file in Xcode and have a look; it’s XML with specific headers, a dictionary and inside that, the Standard Suite. This is a useful starting point, and you could copy and paste this XML into your own SDEF file. However, in the interest of clean code, it’s not a good idea to leave your SDEF file full of commands and objects that your app does not support. To this end, the sample project contains a starter SDEF file with all unnecessary entries removed. <property name="id" code="ID  " type="text" access="r"
<property name="name" code="pnam" type="text" access="rw"
<property name="daysUntilDue" code="CrDa" type="number" access="rw"
<property name="completed" code="TrFa" type="boolean" access="rw"
The outermost element is a suite, so your SDEF file now has two suites: Standard Suite and Scriptable Tasks Suite. Everything in the SDEF file needs a four-character code. Apple codes are nearly always in lower-case and you will use a few of them for specific purposes. For your own suites, classes and properties, it’s best to use a random mix of upper-case, lower-case and symbols to avoid conflicts. The next section defines the application and must use the code "capp". You must specify the class of the application; if you had subclassed NSApplication, you would use your subclass name here. The application contains elements. In this app, the elements are stored in an array called tasks in the app delegate. In scripting terms, elements are the objects that the app or other objects can contain. The last chunk defines the Task class that the application contains. The plural name for accessing multiples is tasks. The class in the app that backs this object type is Task. The first two properties are special. Look at their codes: "ID " and "pnam". "ID " (note the two spaces after the letters) identifies the unique identifier of the object. "pnam" specifies the name property of the object. You can access objects directly using either of these properties. "ID " is read-only, as scripts should not change a unique identifier, but "pnam" is read-write. Both of these are text properties. The "pnam" property maps to the title property of the Task object. The remaining two properties are a number property for daysUntilDue and a Boolean for completed. They use the same name in the object and the script, so you don’t need to specify the cocoa key. The “Insert…” comments are placeholders for when you need to add more to this file. Open Info.plist, right-click in the blank space below the entries and select Add Row. Type an upper-case S and the list of suggestions will scroll to Scriptable. Select it and change the setting to YES. Now you have to modify the app delegate to handle requests that come via script. When a script asks for tasks data, this method will confirm that the app delegate can handle it. If a script tries to insert, edit or delete data, these methods will pass those requests along to dataProvider. To make the Task model class available to the scripts, you have to do a bit more coding. Get a description of the app’s class since the app is the container for tasks. Get a description of the task by id within the app. This is why the Task class has an id property – so that each task can be correctly specified. 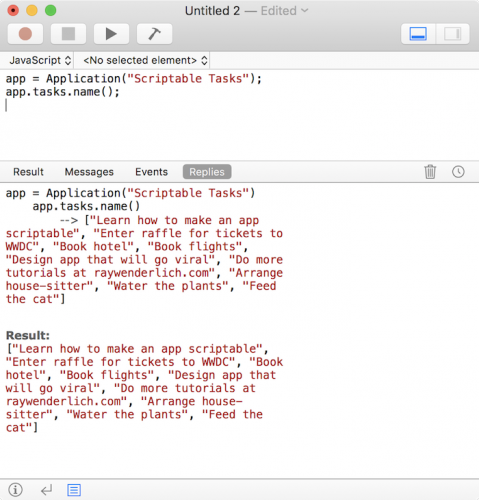 You’re finally ready to start scripting your app! Before you start, make sure to quit any running instance of the app that Script Editor might have opened. 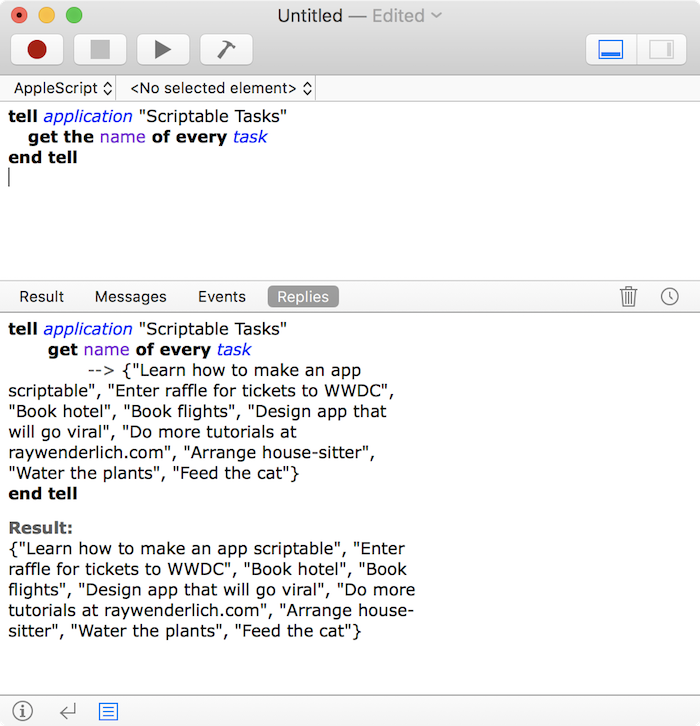 Build and run Scriptable Tasks; right-click on the icon in the Dock and select Options/Show in Finder. Quit the Script Editor app and restart it to let it pick up the changes to your app. Open the Library window, and drag the Scriptable Tasks app from the Finder into the Library window. If you get an error saying the app is not scriptable, try quitting Script Editor and starting it again as it sometimes doesn’t register a freshly built app. If it still fails to import, go back and double-check your changes to the SDEF file. You’ll see the Standard Suite and the Scriptable Tasks Suite. 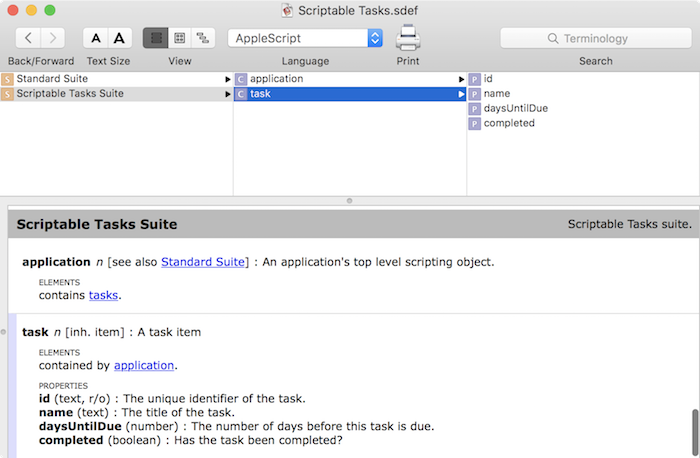 Click on the Scriptable Tasks suite, and you will see what you put into the SDEF file. The application contains tasks, and a task has four properties. Try out a few more of the sample scripts you downloaded earlier. When running the scripts, make sure you set the Script Editor to show Log/Replies so that you can see the results along the way. Each script quits the app before running it again; this is to reset the data after any edits so that the sample scripts work as expected. You wouldn’t normally do this in your own scripts. 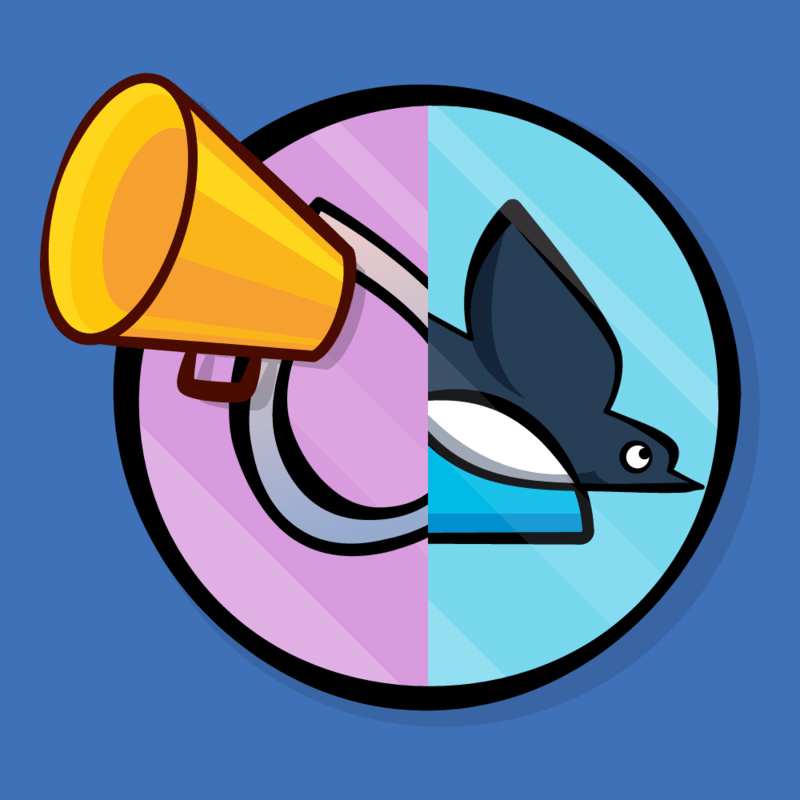 Note: Script Editor can get very confused as you build updated versions of the app, because it tries to keep a version running at all times if you have an open script that is using the app. This often ends up as an older version of the app, so before every build, quit the app. If you see two copies of the Scriptable Tasks app running at any time, or if there appears to be a script error in any of the samples, you can be sure that Script Editor has glommed on to the wrong version of the app. The easiest fix is to quit all copies of the app and quit Script Editor. Clean the Xcode build (Product/Clean), then build and run again. Restart Script Editor and when it opens the script, click Compile and then click Run. And if THAT doesn’t work, delete Derived Data for the app in ~/Library/Developer/Xcode/DerivedData. This script adds new tasks, toggles the completed flag on the first task, and tries to create a task with the same name as another. Hmmm… creating a task with the same name worked! 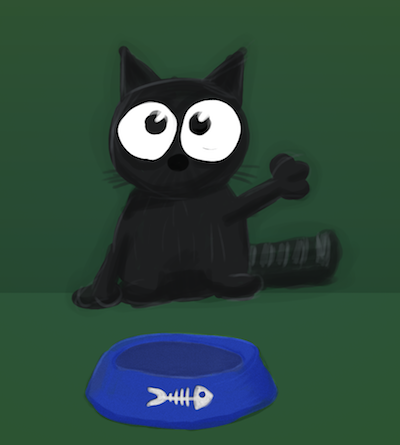 Now you have two “Feed the cat” tasks. 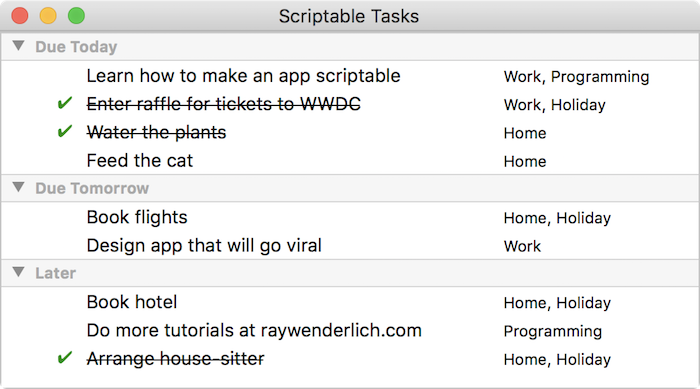 The cat will be thrilled, but for the purposes of this app, task names should be unique. Trying to add a task with a name that is already in use should have produced an error. 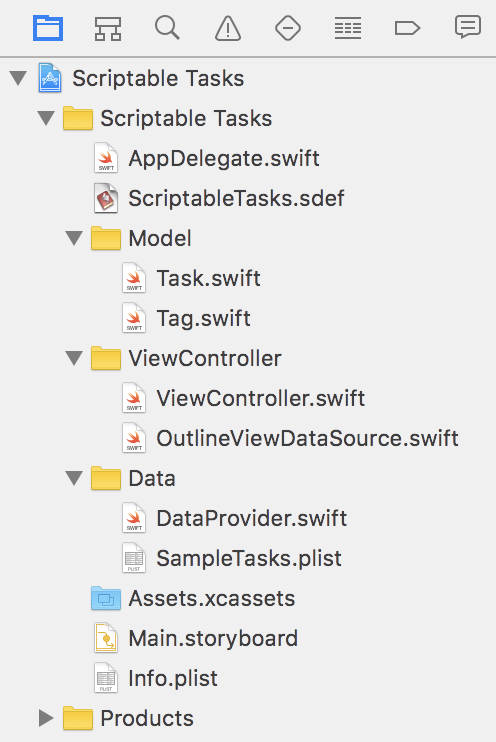 Back in Xcode, look in AppDelegate.swift and you can see that when the script wants to insert an object, the app delegate passes that call to its dataProvider. In DataProvider.swift, look at insertNew(task:at:), which inserts an existing task into the array or appends a new task to the end. command?.scriptErrorString = "Task with the title '\(task.title)' already exists"
Use an existing function to check if a task with this name already exists. Get a reference to the scripting command that called this function. Set the command’s errorNumber and errorString properties; errOSACantAssign is one of the standard AppleScript error codes. These will be sent back to the calling script. Process the task as before. Post a notification of data changes. The ViewController will see this and update the display. This script deletes a task, checks if a particular task exists and deletes it if possible, and finally deletes all completed tasks. 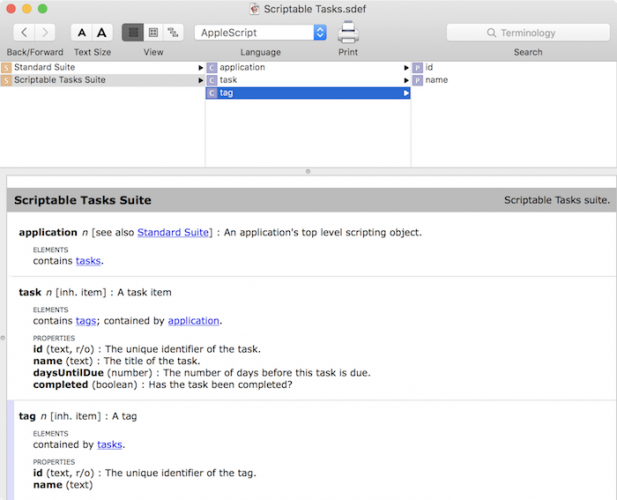 In the sample app, the second column displays a list of tags assigned to each task. So far, you have no way of working with them via scripts – time to fix that! Object specifiers can handle a hierarchy of objects. That’s what you have here, with the application owning the tasks and each task owning its tags. As with the Task class, you need to make the Tag scriptable. Add the override keyword to init. Check that the tag has an assigned task. Check that the task has a class description of the correct class. Get the object specifier for the parent task. Construct the object specifier for the tag contained inside the task and return it. This is very similar to the data for the Task class, but a tag only has two exposed properties: id and name. Now the Task section has to be edited to indicate that it contains tag elements. Quit the app, then build and run the app again. Go back to the Script Editor; if the Scriptable Tasks dictionary is open, close and re-open it. See if it contains information about tags. The app now lets you retrieve tags – but what about adding new ones? You may have noticed in Tag.swift that each Tag object has a weak reference to its owning task. That helps create the links when getting the object specifier, so this task property must be set when assigning a new tag to a task. This method is sent to the container of the new object, which why you put it into the Task class and not the Tag class. 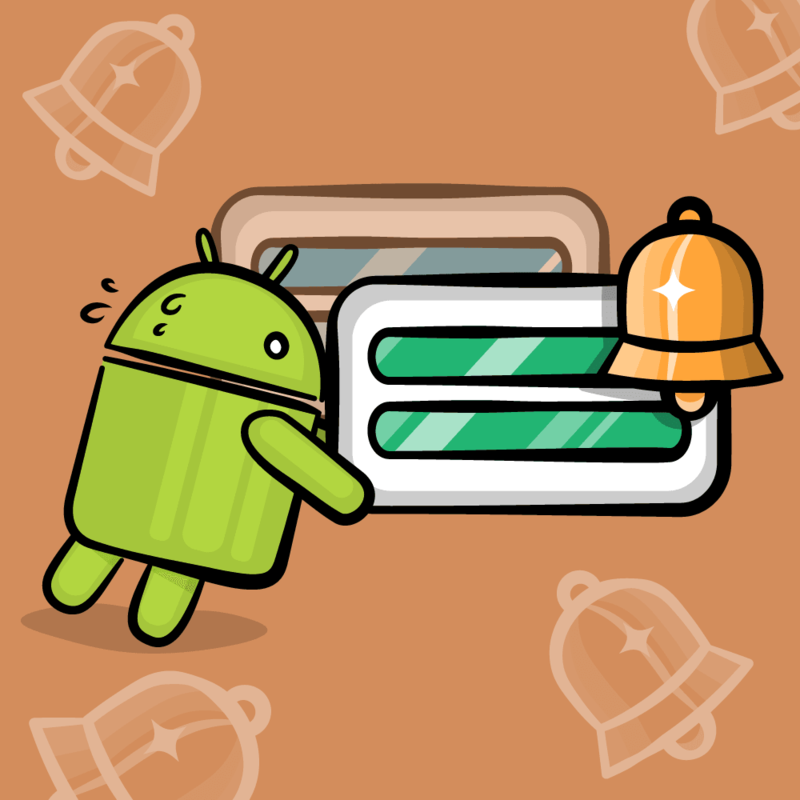 The call is passed to super to get the new tag, and then the task property is assigned. Quit and build and run your app. Now run the sample script 6. Tasks With Tags.scpt which lists tag names, lists the tasks with a specified tag, and deletes and create tags. There is one more step you can take when making an app scriptable: adding custom commands. In earlier scripts, you toggled the completed flag of a task directly. But wouldn’t it be better – and safer – if scripts didn’t change the property directly, but instead used a command to do this? mark the first task as "done"
mark task "Feed the cat" as "not done"
I’m sure you’re already reaching for the SDEF file and you would be correct: the command has to be defined there first. Tell the application that this command exists and what its parameters will be. Tell the Task class that it responds to the command and what method to call to implement it. When defining a method, you provide a two part code. This one combines the codes or types of the parameters – in this case a Task object with some text. The parameter to markAsDone(_:) is an NSScriptCommand which has two properties of interest: evaluatedReceivers and evaluatedArguments. From them, you try to get the task and the string parameter and use them to adjust the task accordingly. You should now be able to run the 7. Custom Command.scpt scripts and see your new command in operation. You can download the final version of the sample project here. 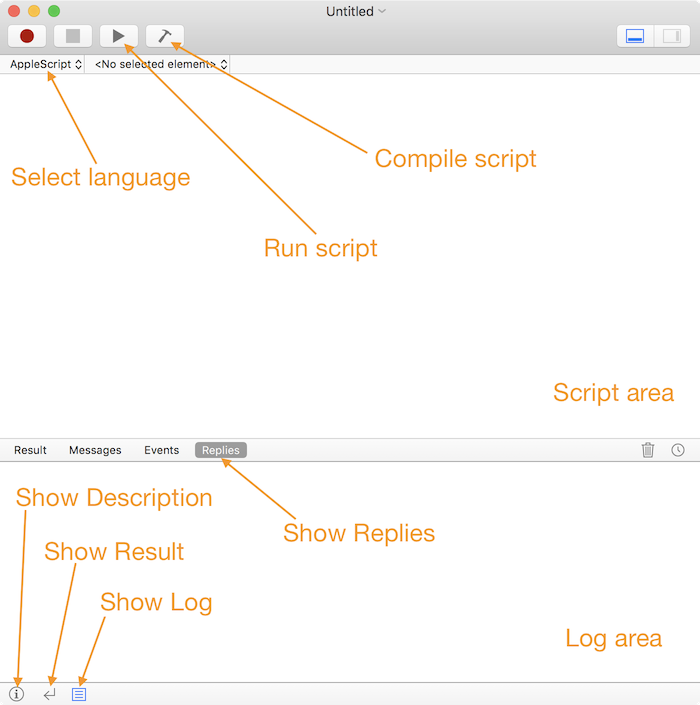 There wasn’t room to cover inter-app communication in this making a mac app scriptable tutorial, but to see how to work between apps, check out 8. Inter-App Communication.scpt for some examples. 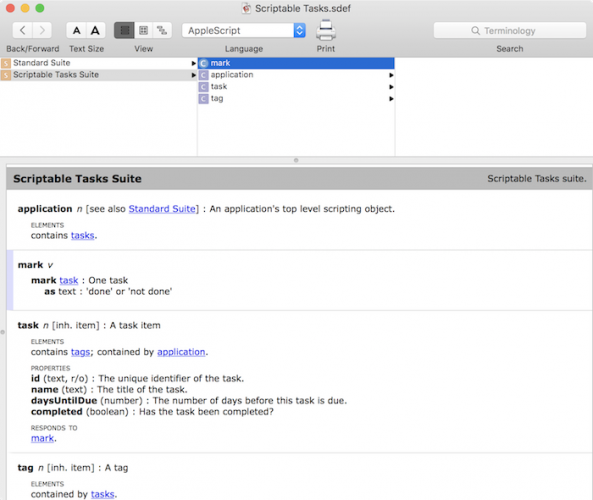 This script gathers a list of incomplete tasks due today and tomorrow, inserts them into a new TextEdit file, styles the text and saves the file. For more information about scriptable apps, the official Apple docs on Scriptable Applications are a good start, as is Apple’s Overview of Cocoa Support for Scriptable Applications. I hope you enjoyed this making a mac app scriptable tutorial; if you have any questions or comments, please join the forum discussion below!